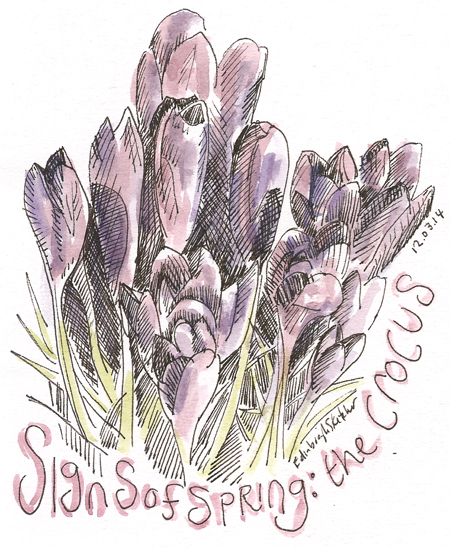 Looking for signs of spring today, and what better than these beautiful crocuses sketched in Edinburgh today. I seem to have been scouring the embankments and park lands for weeks looking for these flourishes of colour which herald the new season and the promise of warmer weather ahead. And then all of a sudden they are everywhere, and so seems the sun this week. Long may it continue!! EdinBlogger liked this on Facebook. Patricia Shaw liked this on Facebook. @fatfacebikini thanks Karen. Lovely spring sketches @edinsketcher as always. Margaret Newlands liked this on Facebook. Tanya Arte liked this on Facebook. Betty Hunter liked this on Facebook. Yanisa Dithaluksana liked this on Facebook. Robert Larsen liked this on Facebook. Paula Wilson liked this on Facebook.